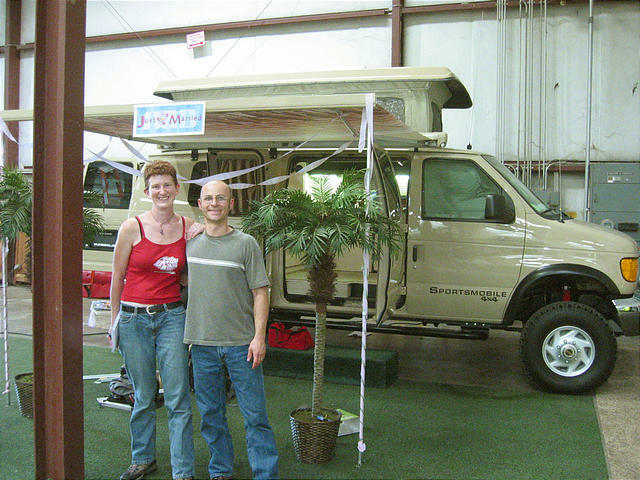 In 2004, we bought a Sportsmobile camper van. 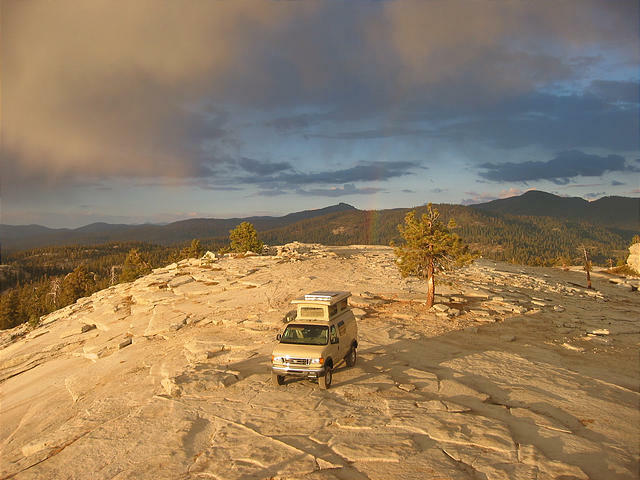 We are passionate about backroad exploring and boondock camping — avoiding RV parks and official campgrounds if at all possible. The Sportsmobile was a step up from sleeping in the back of a Jeep Grand Cherokee, which wasn't really suitable for more than one person. 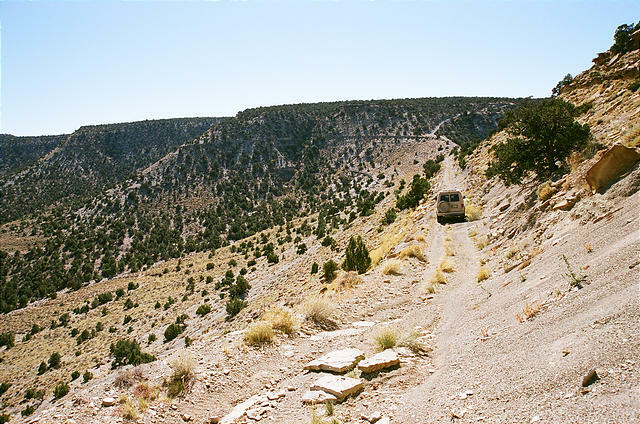 Our dream was a 4x4 camper van — something big enough to stand in, but small enough to navigate the twisty trails we want to explore. 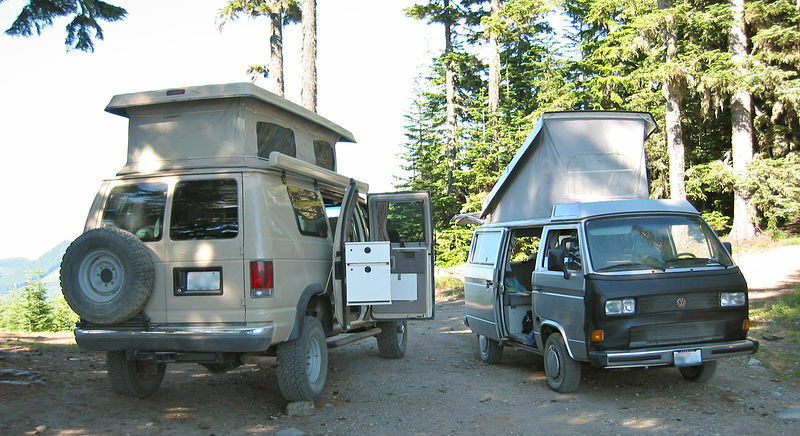 The 1980's-era Volkswagen Syncro Westfalia vans were very tempting, but we got the impression that they have issues with reliability and lack of engine power. 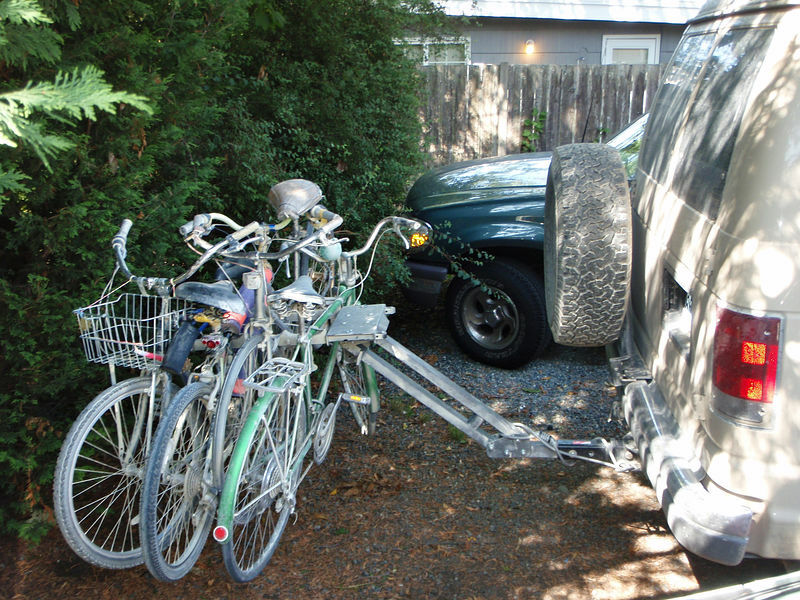 We did consider a pickup truck bed camper, but in those vehicles the front cab area was wasted as living space. 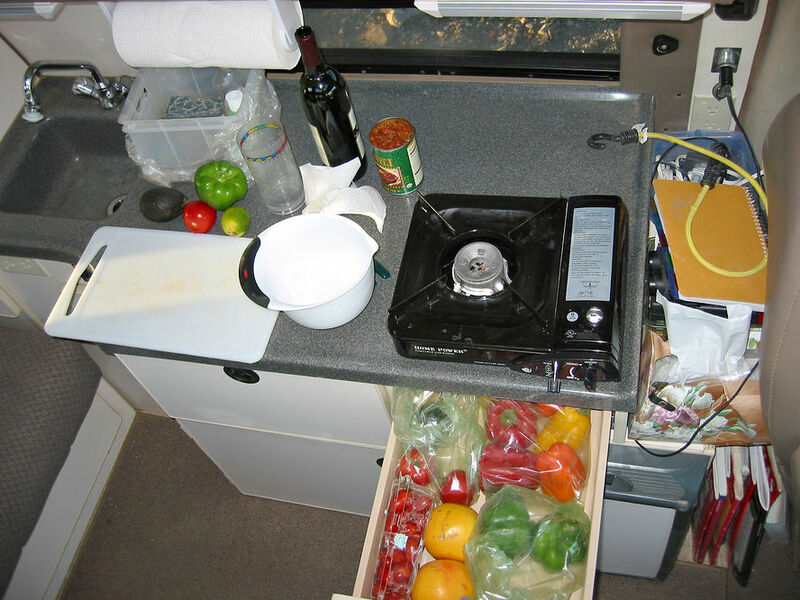 RB50 Layout: The "RB50" plan is an interior layout very similar to that you'd find in a WV camper van. "RB" stands for "Regular Body", which is about 2 feet shorter than an "EB" or "Extended Body". 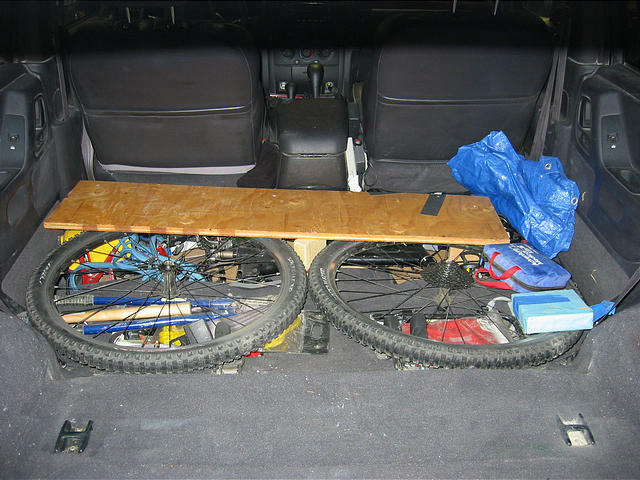 An extended body would have allowed us more storage room, but at the expense of vehicle maneuverability. 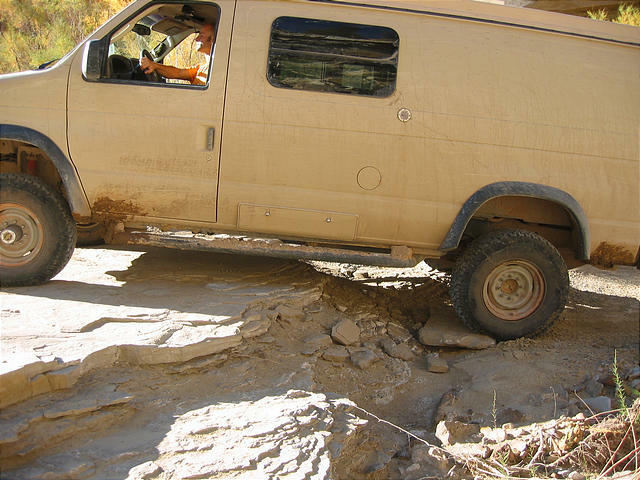 Turning around a full-size van on single-track trails is difficult enough already! 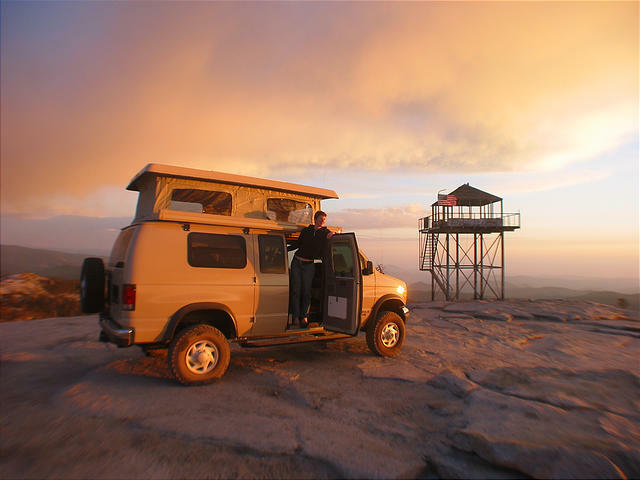 Penthouse Pop-Top: This is a key Sportsmobile feature, allowing us to stand up inside the van and adds a second "upstairs" bed that provides a panoramic view and lovely cross-breezes. 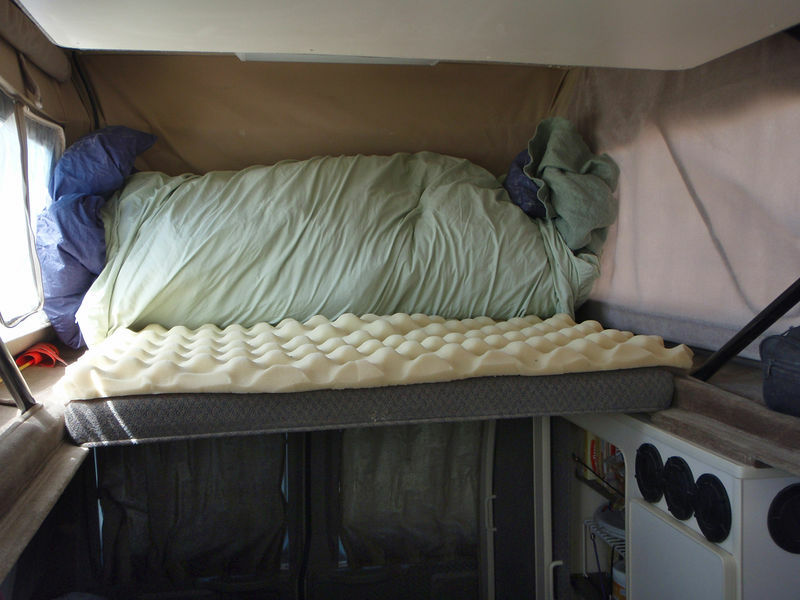 We always sleep upstairs (details...), except for the few times when we're "stealth" camping in cities, etc. 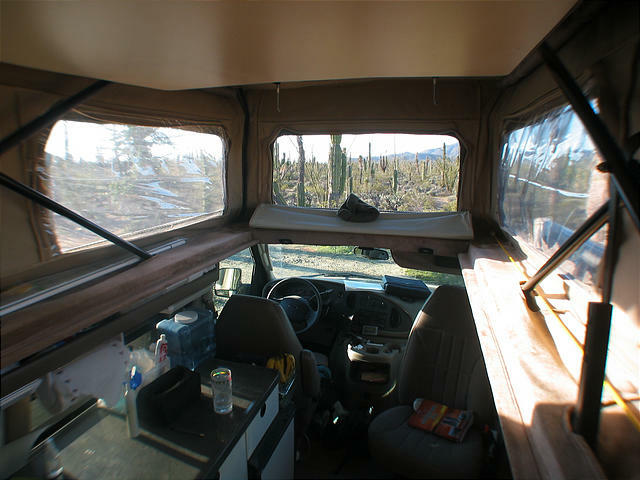 The pop-top has five windows, each with curtains and screens behind unzippable flexible clear plastic. The screen on the front window is also unzippable (useful for taking photos from inside the van). The screens provide nice airflow, and stop most insects. 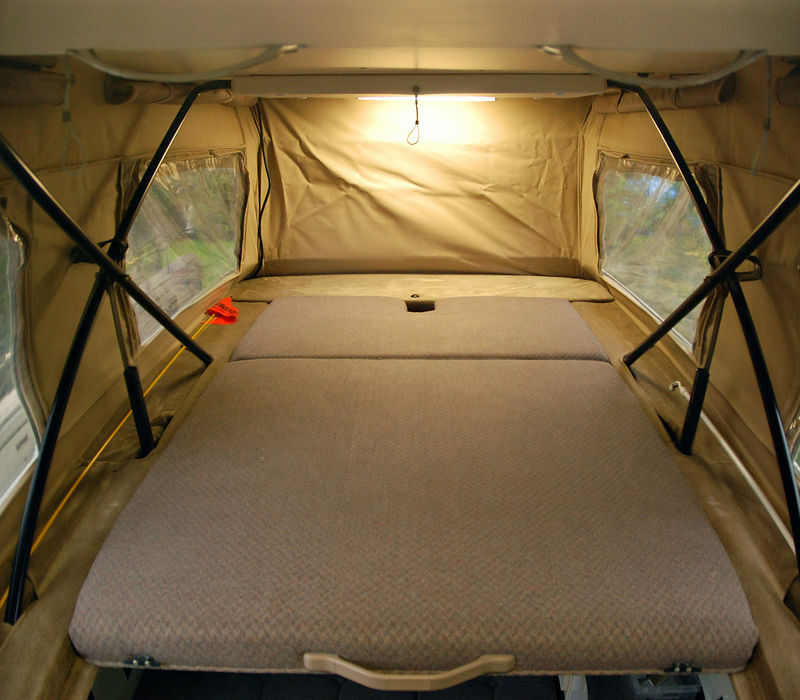 We chose the electric pop-top option so we can have the option of placing kayaks or other heavy options to the roof. The other pop-top choice is a mechanical spring-loaded mechanism which only works for roof weight that doesn't change. The only disadvantage of the electric top is that it takes about a minute of holding down a switch to raise or lower the top. The penthouse pop-top can shift slightly while driving on rough roads, and this eventually caused some wear on the roof paint where it'd been rubbed by the top. 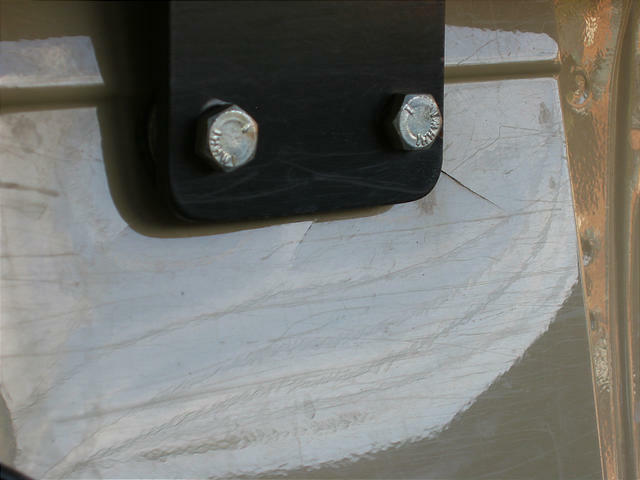 When this started exposing bare metal and rusting, we had to repair it and apply some thick protectant tape. Rear A/C: Sportsmobile sells a "Starcool" system that provides plug-in or generator-powered electric air conditioning through rear vents. 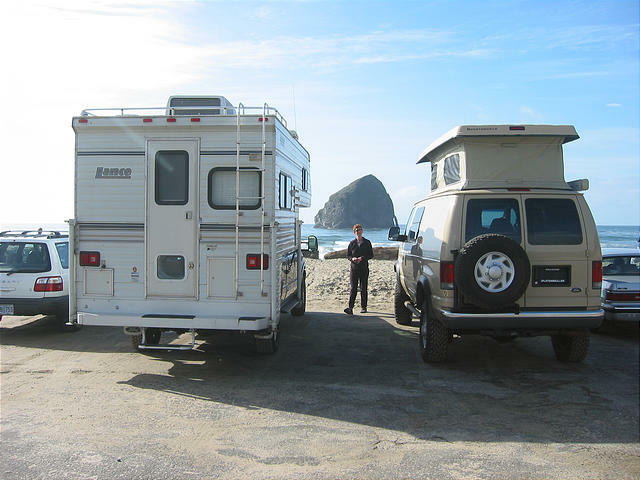 We never plan to camp in RV parks, so we chose Sportsmobile's "rear A/C" option — which includes the Starcool's rear vents, but no electric-powered compressor. 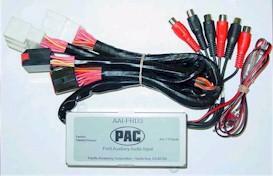 This system can therefore only be used while the engine is running. We don't find ourselves using the rear A/C often, but with rear passengers on hot days it's nice to have. 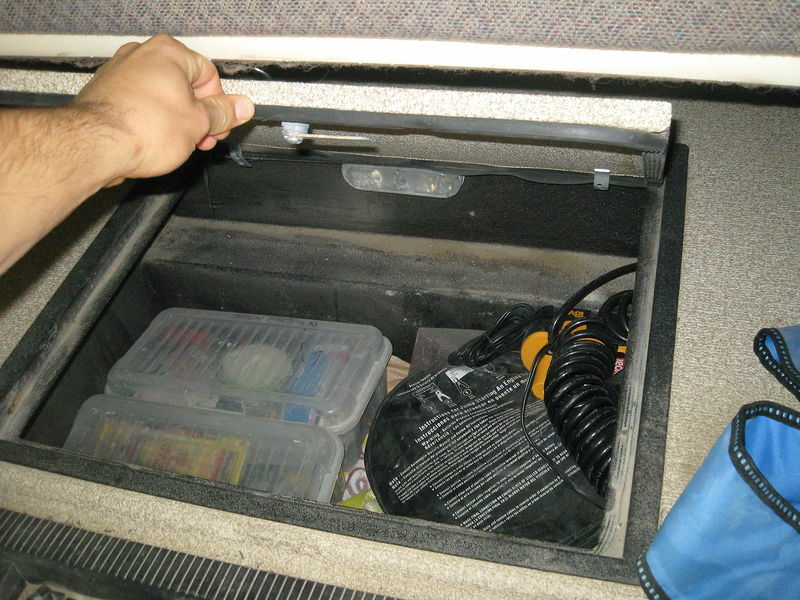 Water: We have 10 gallons of built-in fresh water storage under the rear seat. One regret of ours is that we'd love more water storage if possible. If we're not careful, we can easily use up the contents of the 10-gallon water tank pretty quickly, especially when washing dishes. 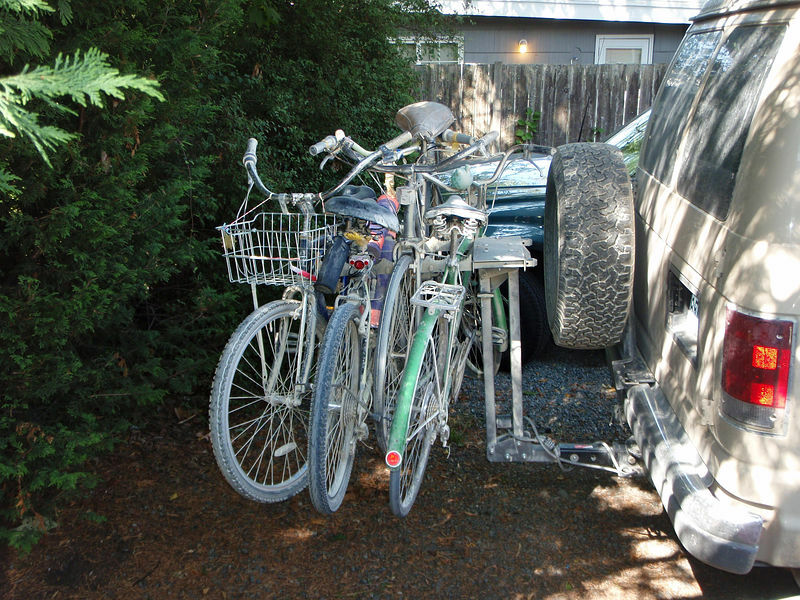 We usually end up carrying one or more additional 5-gallon plastic water jugs in the back. 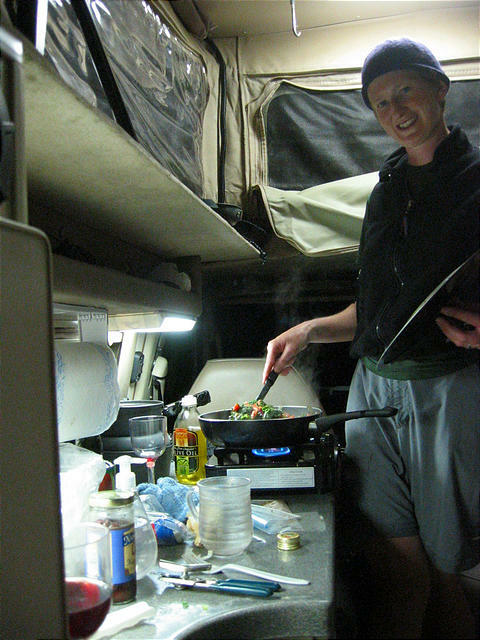 Stove: We're happy with using a portable stove — so we can choose to cook inside or outside. 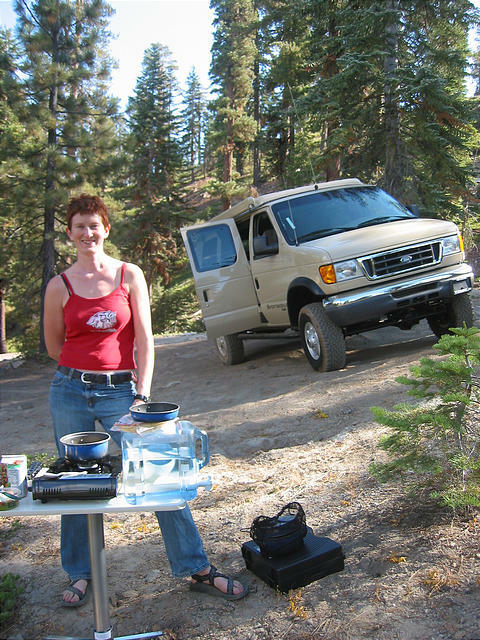 Our stove is a little $35 one-burner butane unit that's popular with catering businesses. It lights easily. The stove uses little spray-can-sized butane canisters that are somewhat difficult to find in stores so it's best to stock up when you find them. Lately, I've been buying them online. Each canister is enough for maybe four meals worth of cooking. At very low ambient temperatures, butane can have trouble providing a strong flame — especially when the can is almost empty. 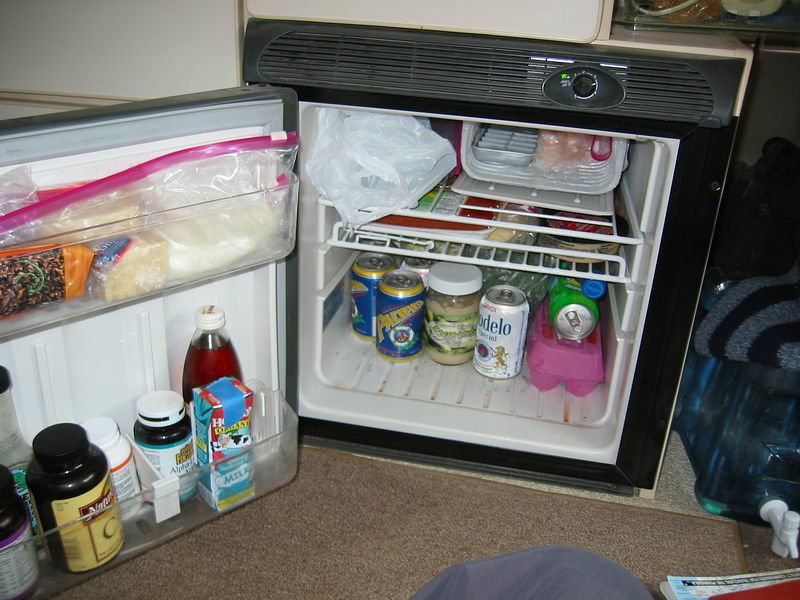 Refrigerator: The smaller (2.7 cubic foot) Norcold refrigerator runs on 12V DC or 120V AC electric power. This is referred to as a "2-way" fridge. There are also "3-way" fridges, which can also run on propane instead of electricity. 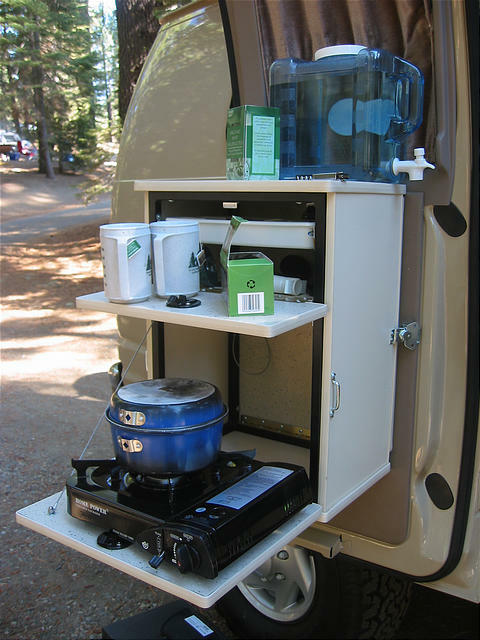 Unlike propane refrigerators, 2-way fridges don't require the van to be parked level to operate. The rooftop solar panels have no trouble powering the electric fridge indefinitely without us having to start the engine. 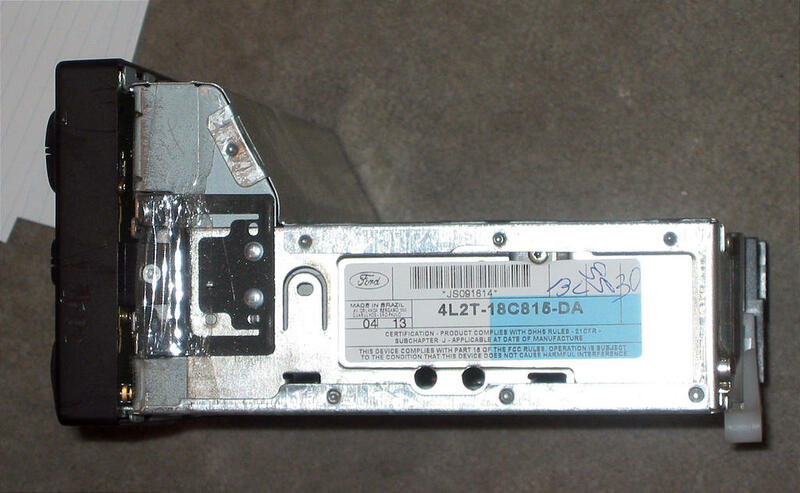 Radio: We kept the stock Ford radio/CD player unit because we like its large buttons and low theft desirability. The sound quality is fair. 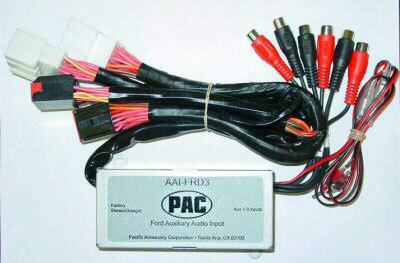 We've also added an XM satellite radio receiver. 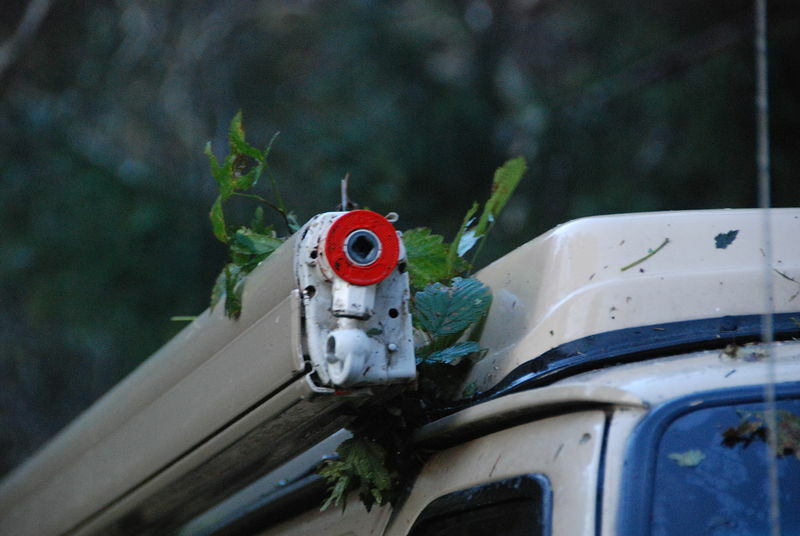 The XM radio has mostly worked out very well for us, but we do experience some reception cut-outs in heavy trees or mountainous areas where the southern view to XM's satellites over the equator can get blocked. In major US cities, XM is also broadcast from local receivers, so large buildings aren't a reception problem. We have successfully gotten XM satellite radio reception as far south as central Mexico. 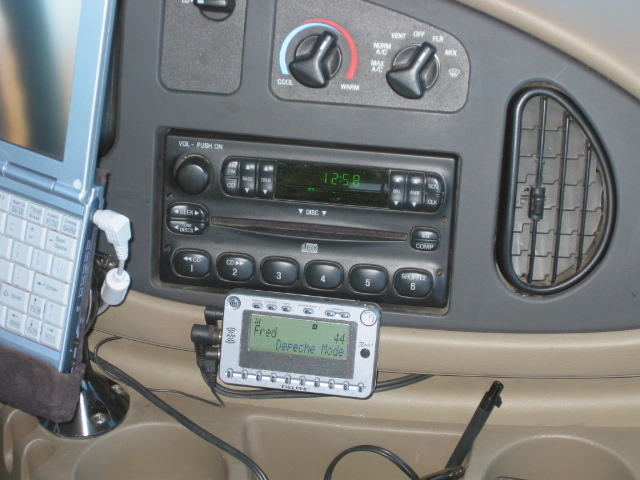 To connect the XM to the Ford radio without resorting to using an FM modulator, we found a special unit which connects directly to the back of the radio. Awning: We don't use the attached awning all that often, but it is occasionally nice to have when it's raining or in the hot midday sun. 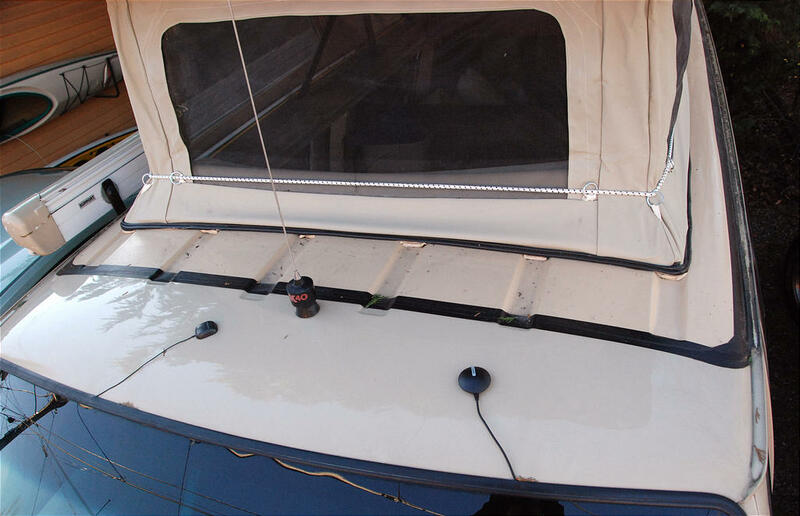 Unfortunately, the awning mounted in a way that allows it to shake, and over time the body mounts have caused deep cracks in the surrounding paint. We are strongly considering removing the awning and perhaps using a simple foldable shade structure instead (or maybe nothing at all). 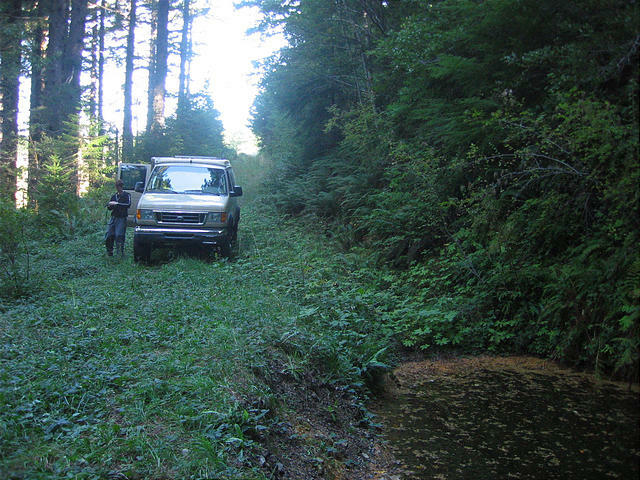 When driving overgrown trails, the awning is also frustrating in that it sticks out — acting as a giant hook that snags any passing low-hanging saplings. Recently, the awning front end-cap finally got smashed off by a tree. 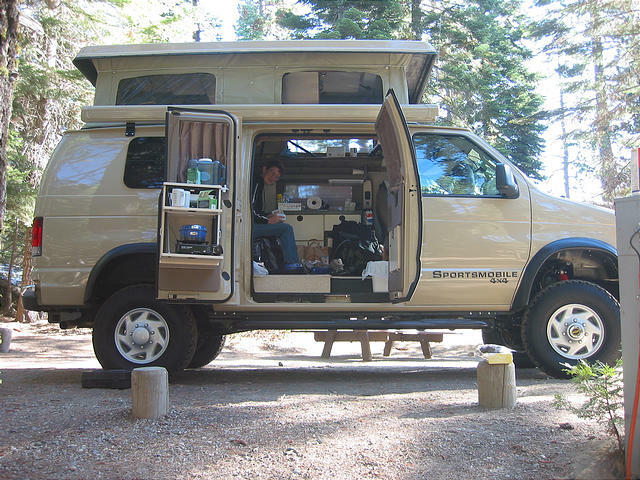 Rotating Seats: Both front seats rotate to serve as living space while camping. 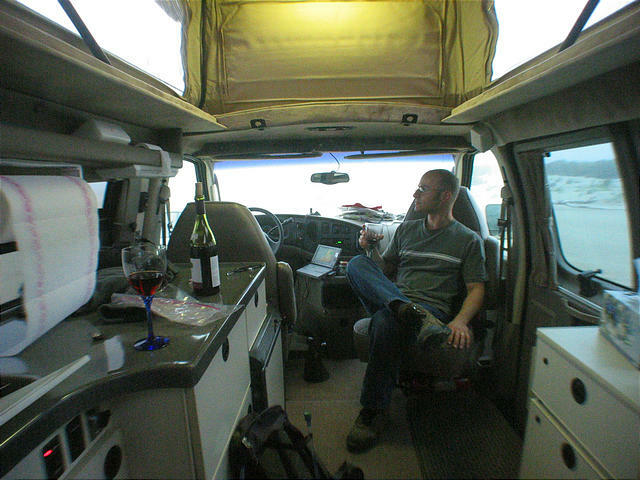 This is one of the huge advantages a camper-van has over a pickup truck-based camper — the "driving" area also serves as living space. 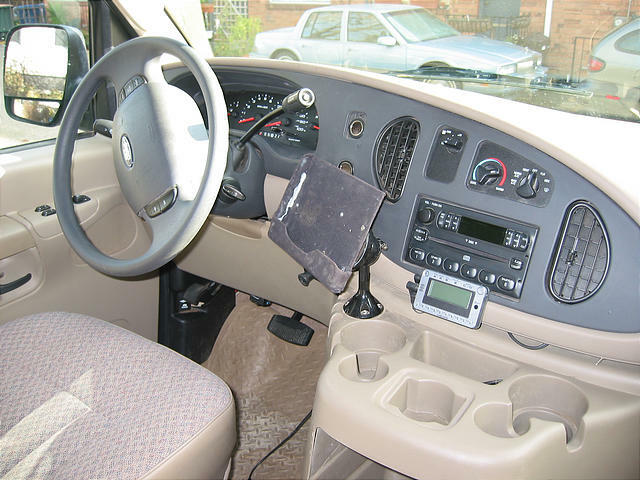 The passenger seat rotates 180 degrees to face the interior of the van. Only the manual (not power) driver seat can rotate, and it rotates no more than a little past 90 degrees — but it's still useful. No Propane: For simplicity we have no onboard propane installed. This means no propane furnace, no built-in propane stove, and no propane hot water heater. In cold weather, we've occasionally missed the luxury of having a built-in furnace, but we're pretty happy with the little Coleman propane catalytic heater we bought. 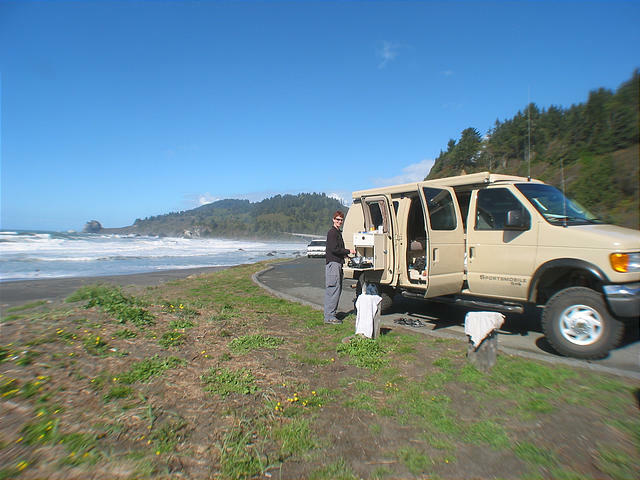 And we don't intend to be doing much cold weather camping. Solar Panels: We have two Kyocera Solar Panels, providing a total of up to 130 watts of power. The solar panels do a good job of keeping up with our electric refrigerator and nighttime electric light usage. 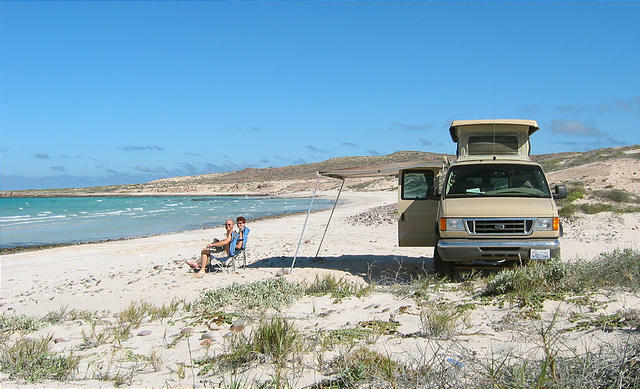 We can camp indefinitely without starting the engine (or using a generator). 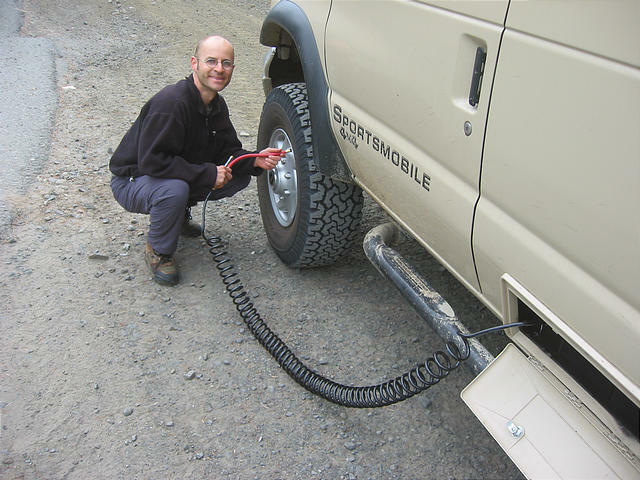 ExtremeAire Pump: The onboard ExtremeAire Pump has been fantastic for airing up the tires again after letting air out for better ride and traction on washboard and sandy roads. 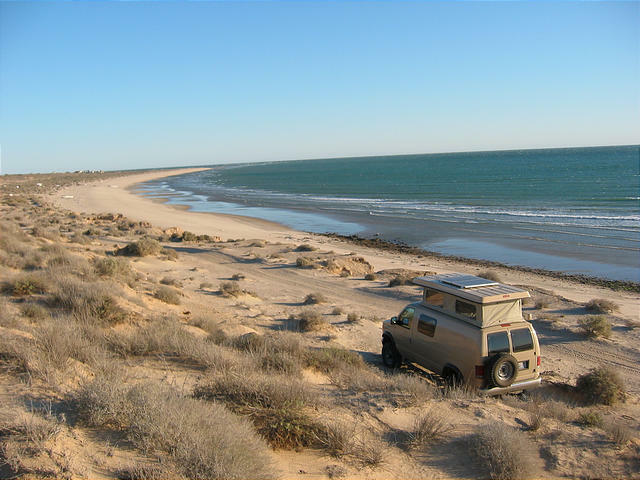 We regularly air down from 50 PSI to 35 PSI for backroad driving and even lower (maybe 20 PSI) for deep sand. 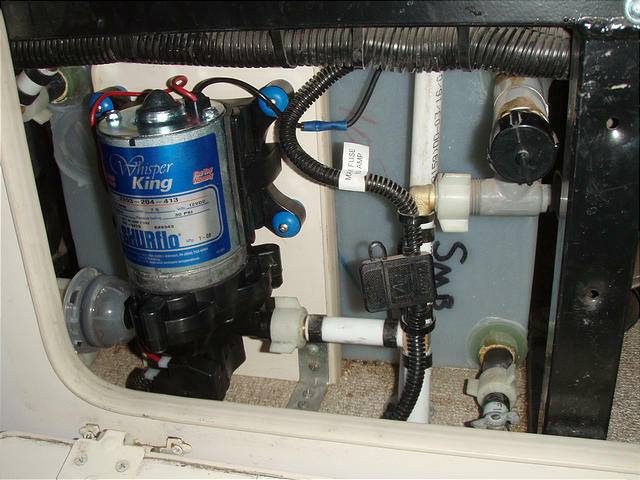 The ExtremeAire Pump does seem to have a bad habit of blowing its 60 AMP fuse in the engine compartment, so we keep plenty of spares, or just use a wire to bypass the fuse and rely on the circuit breaker instead. Toilet: The Thetford Porta Potti is a portable toilet with electric flush. It works really well! It's a small cube that slips into a cabinet, or can be taken out to serve as a (covered) footrest. The lower half of the toilet splits off to be carried into a restroom for its contents to be disposed in a toilet. 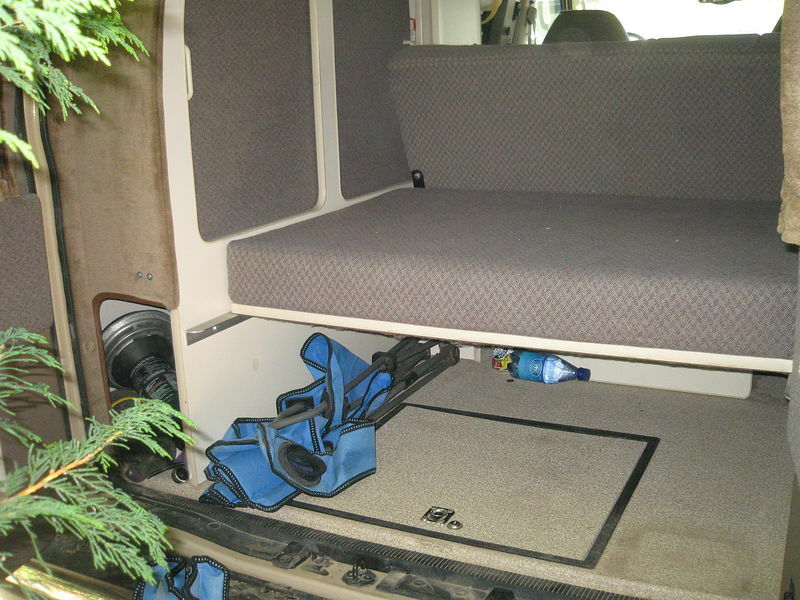 Underbody Storage: By moving the spare tire from its normal underbody location to a rear-door mount, Sportsmobile can add a convenient interior-accessible underbody storage compartment. We store all our tools in here. Gas Tank: We had the larger (46 gallons vs. 35 stock) Transfer Flow gas tank installed by Sportsmobile. It's very nice to have the extra range, especially when driving in Mexico. This gas tank was the cause of some initial frustration until we figured out how to get the last 10 gallons to fill properly at the gas pump. 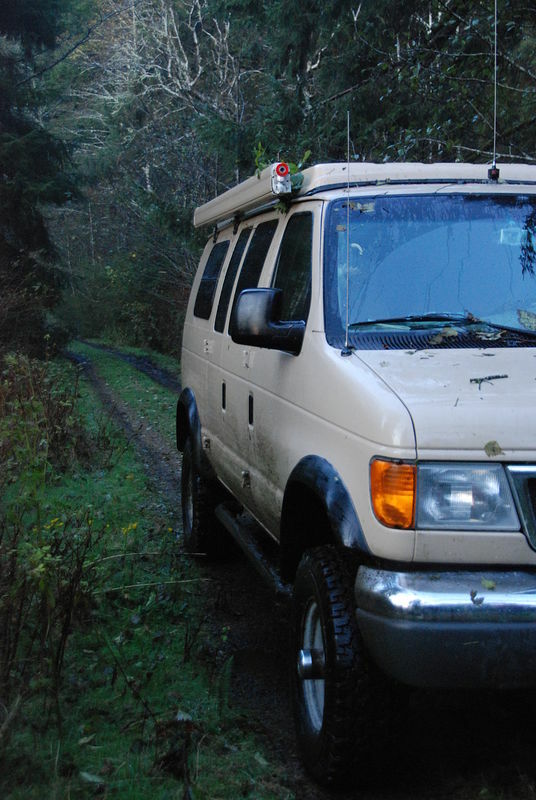 Sportsmobile 4x4: The Sportsmobile 4x4 conversion has worked very well for us. 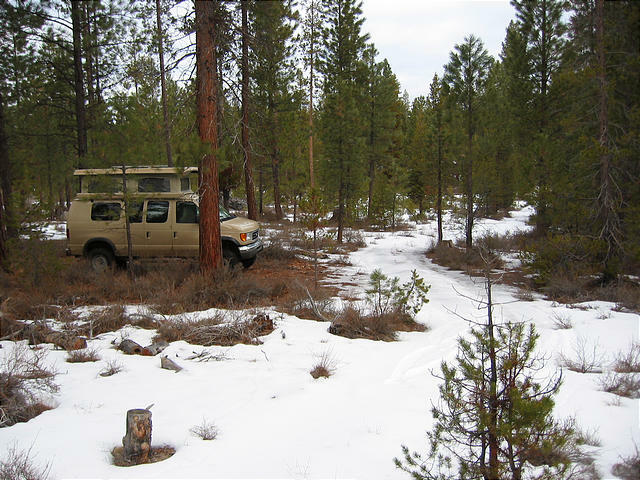 We get a lot of use out of the 4x4, for trails, snow, and camping sandy beaches. It's a beefy system, with a significantly tighter turning circle than other 4x4 van conversions out there. (This is very handy for tight mountain trail switchbacks.) The only disadvantage of the Sportsmobile 4x4 system is a disappointingly short front axle travel of less than 2 inches. The front locker and rear limited-slip provide outstanding off-road traction. Adding the ARB air locker was probably overkill, but it comes in handy once in a while. We might have also sprung for the stronger full floating rear axle if we'd known about that option. Tires: BFG All-Terrain T/A KO LT285/75R16/D (33") on stock steel 16x7 Ford rims. Many people opt for the larger BFG 315/75R16 tires instead, but these require custom rims. 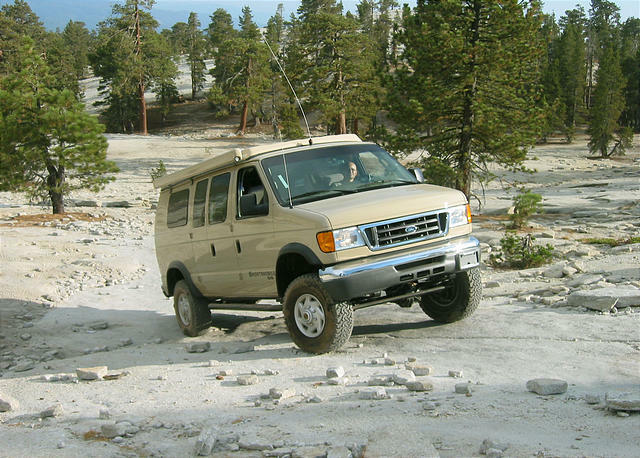 At some point BFGoodrich specified 16x7.5 to be the minimum size for their LT285/75R16 tires, so these tires are no longer recommended for the stock Ford E-series van rims. 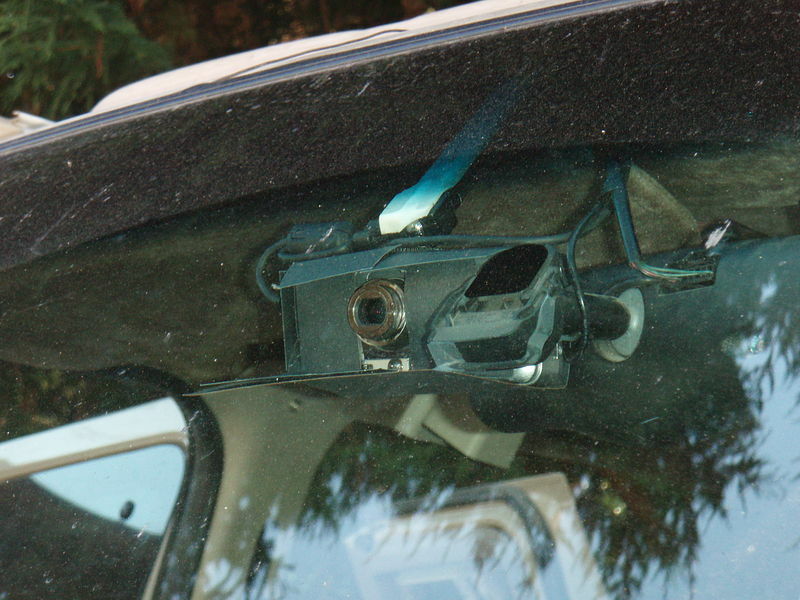 Driving with locked hubs: We discovered that extended driving at high speeds (e.g. 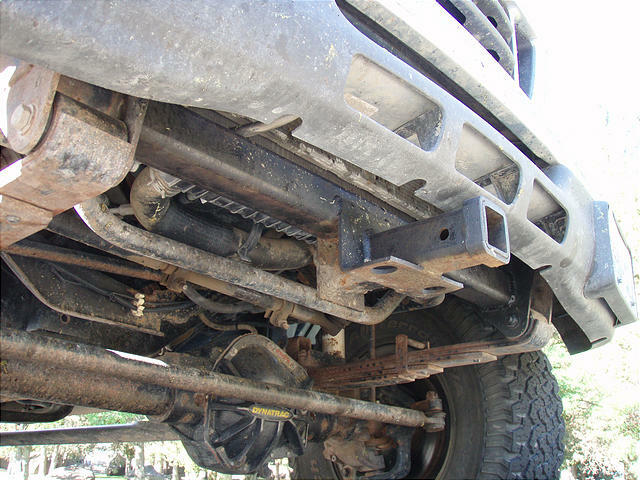 70+ MPH) with the front hubs locked (even in 2WD) can cause the front end to heat up so much that it pukes out differential fluid, spraying the left-front wheel well. 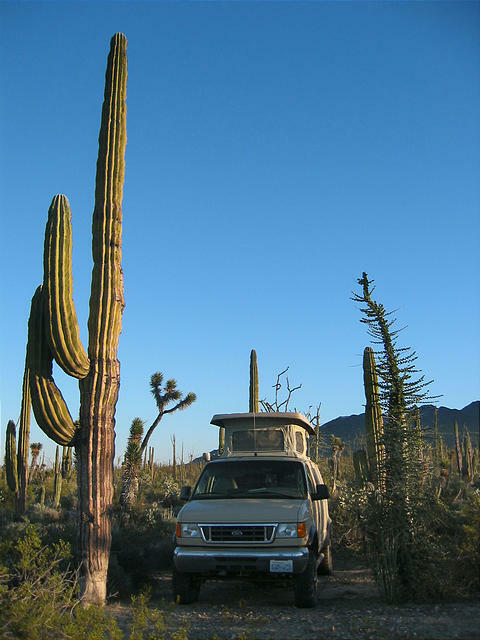 It really freaked us out when this first happened to us when driving down in Baja. 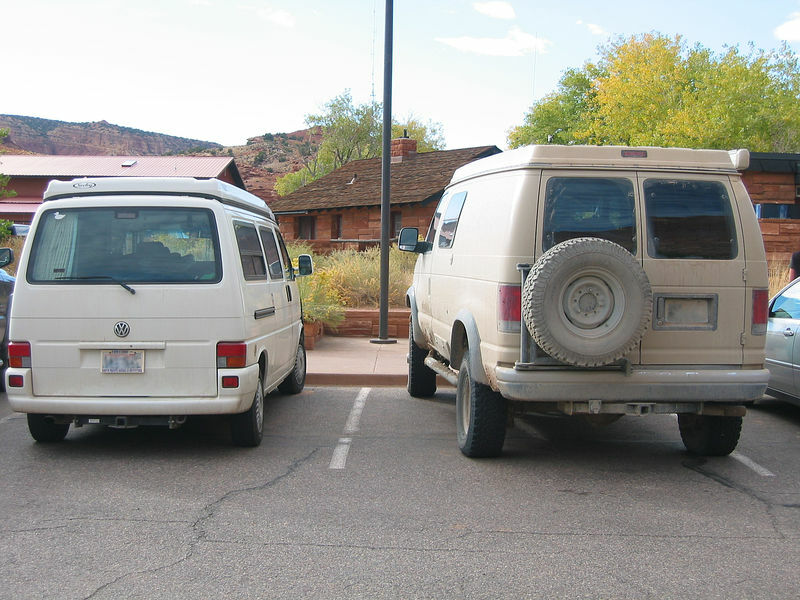 Other common 4x4 van conversion options include the popular Quigley and Salem Kroger. 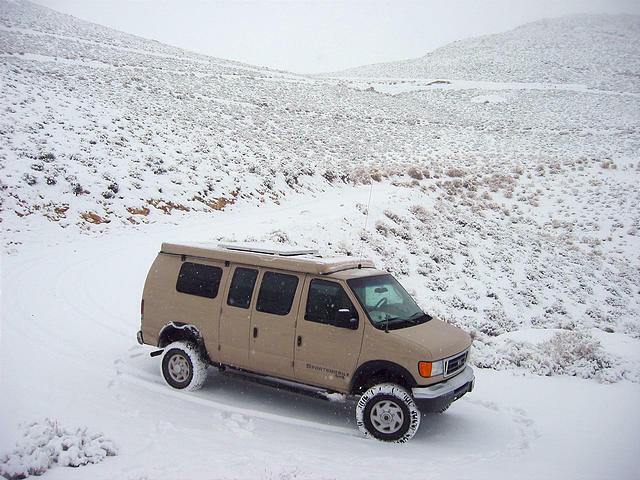 Ford E-350 Van: It turned out that the Ford (instead of Chevy or Dodge Sprinter) was pretty much the only way to go if we wanted four wheel drive. 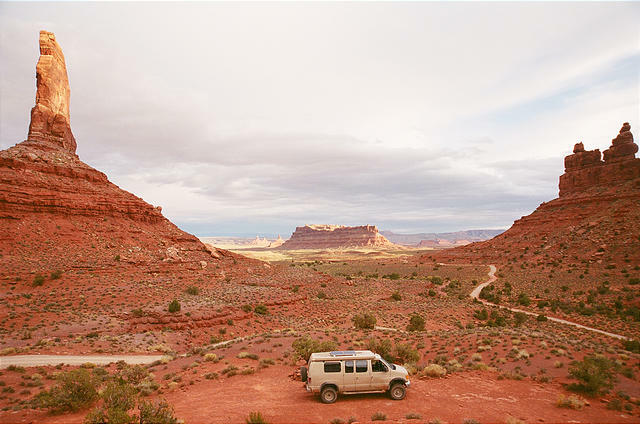 We selected Ford's shorter "regular body" (instead of the "extended body") van for better ability to navigate tight backroads and trails. 6.8L V-10 Gasoline Engine: There were two Ford engine options: the 6.8 liter gasoline V-10 and the 6.0 liter diesel V-8. Both are comparably powerful engines. The diesel gets perhaps 10-20% better mileage, but diesel fuel inherently supplies more energy per gallon — and also costs more these days. It came down to personal preference that led us to choose the gas engine over diesel. 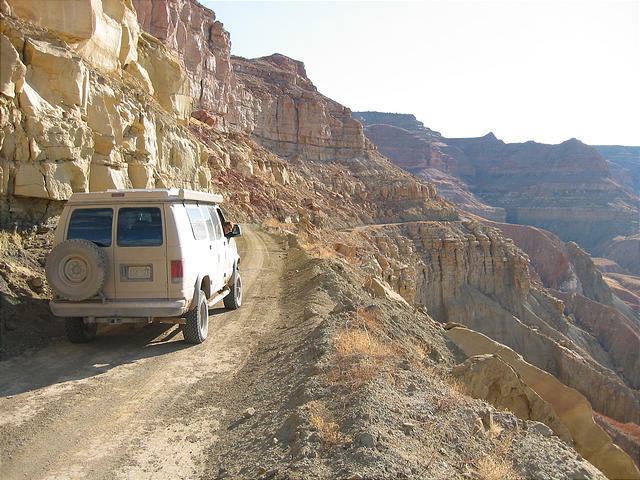 We weren't happy with the extra noise and fumes we'd have to put up with from a diesel engine, especially when driving in the backcountry on slow trails with the windows open. However, going with diesel would have had the advantage of allowing us to use diesel appliances, such as a diesel-fired stove, furnace, or hot water heater. 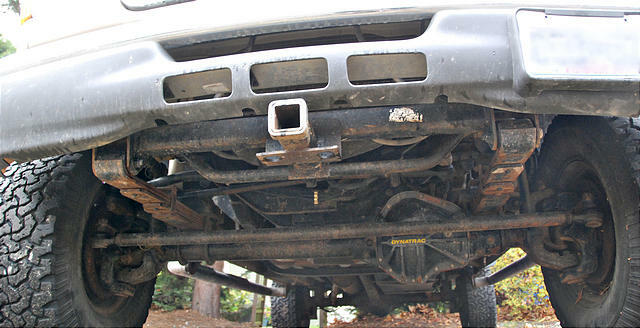 Front Hitch: We had a custom front trailer hitch added for a front attachment point for forward pulls. We don't have an electric winch installed, but for recovery we can attempt to use a high-lift jack or a hand winch (4000lb T-516d Griphoist/Tirfor using 7/16" cable). A front hitch wouldn't be necessary if we'd had Sportsmobile install custom bumpers, but we prefer to avoid the extra weight and the "extreme-4x4" look — we don't want the van to stand out any more than it already does! 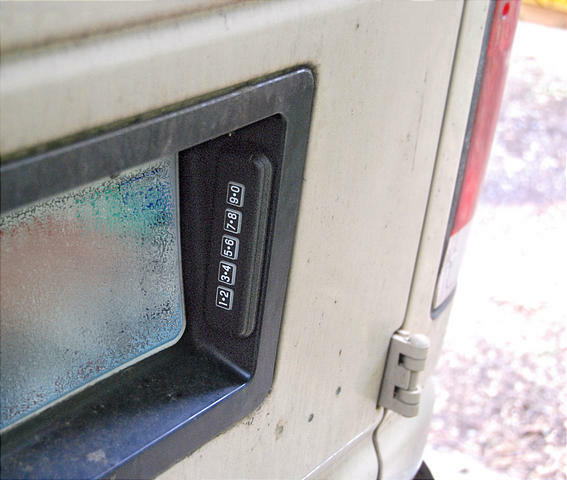 Keyless Entry: One simple modification was the addition of a stick-on wireless keyless entry keypad — so we don't have to find the keys every time we need something out of the van. And, now we can't get locked out! We bought a Ford keypad on Ebay for less than $30, and we love it! It's designed to be stuck onto the driver's door, but it can go anywhere. We placed the black keypad in the black rear license plate area, where it's pretty discreet. The keypad is adhesive-backed, and comes with simple programming instructions. 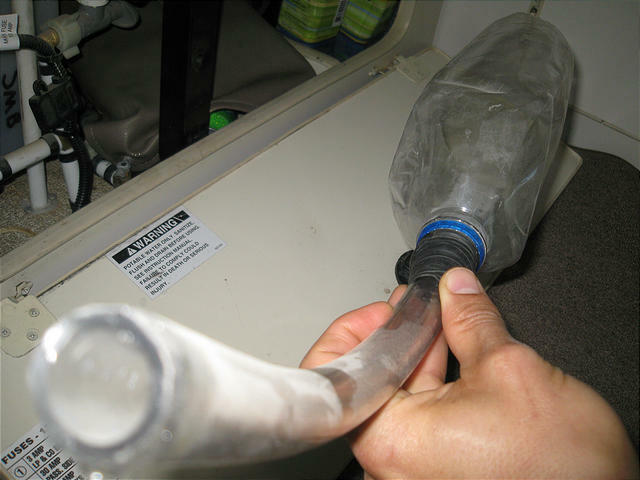 Inside Water Refilling Funnel: Sometimes the only way to get fresh drinking water is to buy it, so we needed a way to get bottled water into our tank. 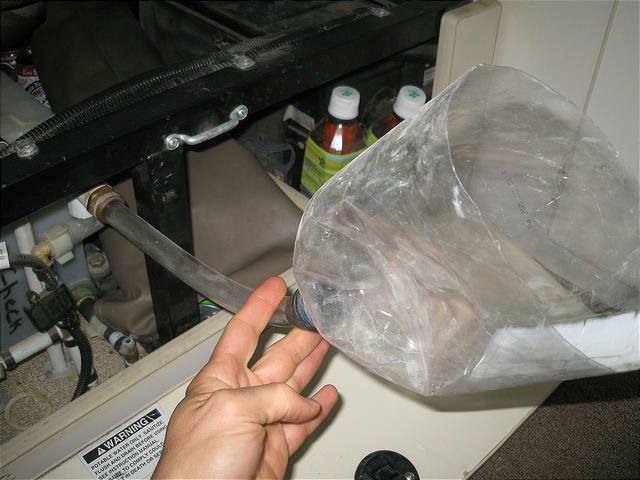 We created a funnel out of a cut two-liter soda bottle and some hardware store clear tubing of a diameter which just (with a little trimming) fits inside the Sportsmobile's underseat water hose intake connection. We've done lots of inside water refills in Mexico. In most small towns, there are water stores (Mexicans drink lots of bottled water), where reusable 5-gallon plastic jugs (like those on top of an office water cooler) are brought in to be refilled with drinking water. At these stores, we hand them our 5-gallon Coleman plastic water container, and for a few pesos they scrub and wash it, then fill it with drinking water — which we then pour into our Sportsmobile's 10-gallon tank. We repeat this process to completely fill our tank. Headlights: The headlights on the Ford van are only adequate. We tried replacing the bulbs with higher-wattage (100W) high beams, but these bulbs eventually caused the fuse to blow. 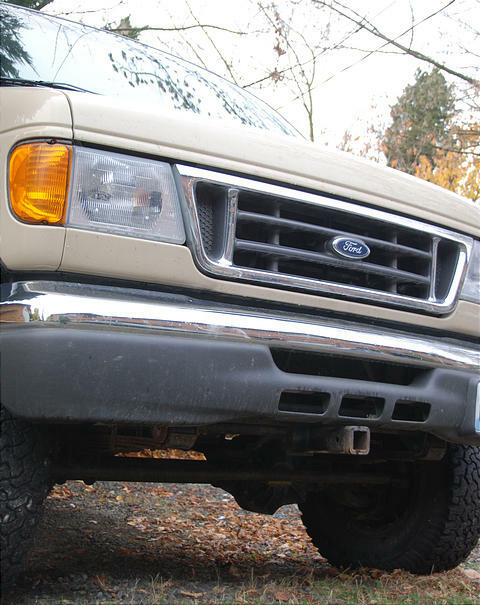 Daylight Running Lights: One of the first customizations we did was to disconnect Ford's daylight running lights. We can turn on the headlights ourselves if we want to be better seen on the road. In campsites, it's nice to not disturb nearby campers by having the headlights automatically light up whenever the ignition is turned on (to roll up the windows, or whatever). 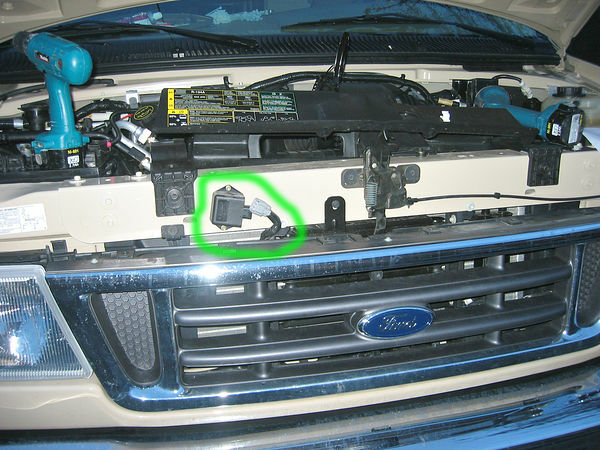 On our 2004 Ford van, disabling the daylight running lights is as simple as disconnecting a single plug located behind the grille. 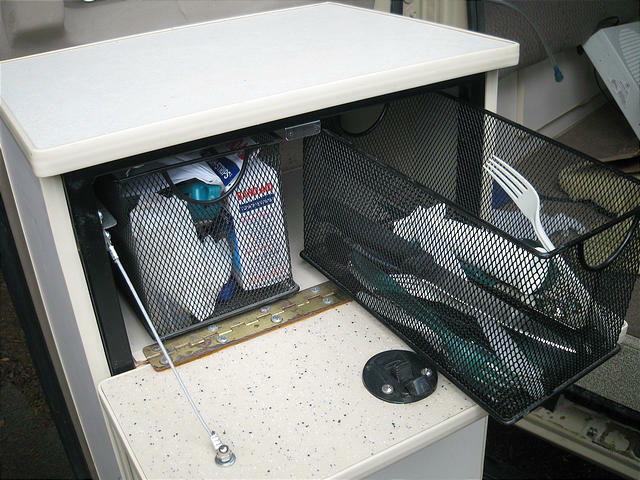 Locking Gas Cap: In these days of expensive gas, and for peace of mind, we installed a Stant Model 10510 locking gas cap. Ride: Well, it does ride like a truck. A cushy truck... but certainly not a luxury SUV. 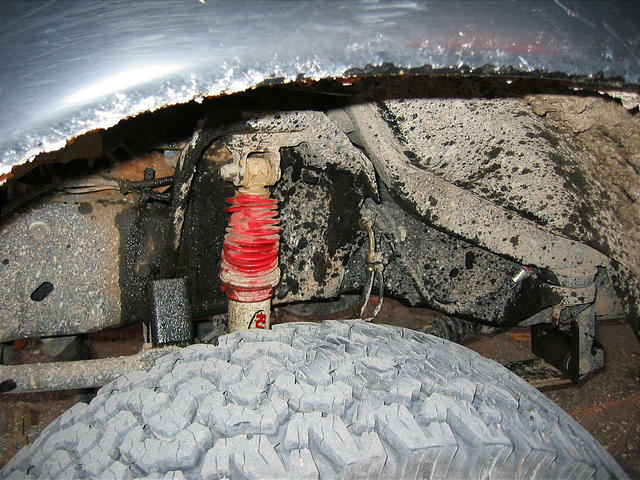 There's a lot of unsprung mass — the beefy solid axles, differentials, driveshafts, big wheels & tires all reside below the suspension, with nothing but the squish of the tires themselves to soften their ride over rough terrain. 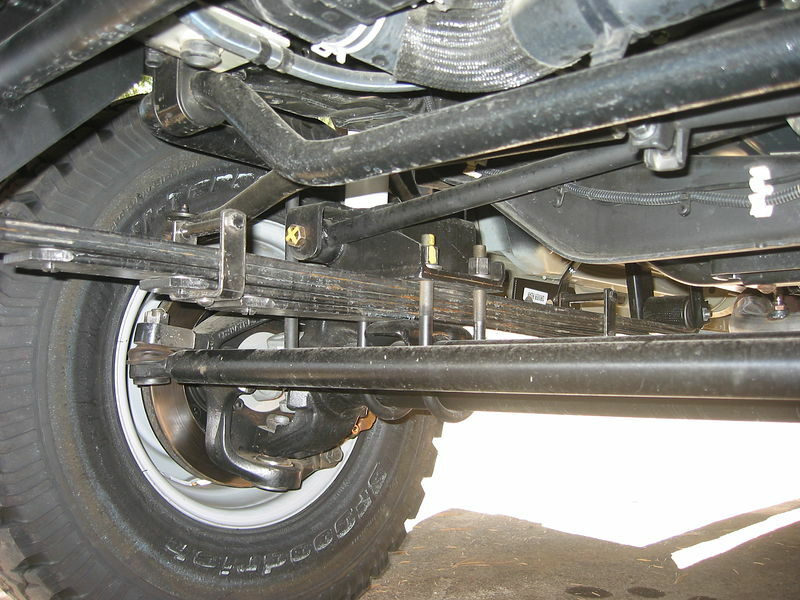 Airing down helps a lot — the tires become a second suspension under all these parts. We regularly air down to 35 PSI on dirt roads. The worst place to experience the Sportsmobile's ride is on poorly constructed highways — driving at full tire pressure over misaligned concrete segments can lead to violent thumps and alternating front/rear vehicle bouncing. 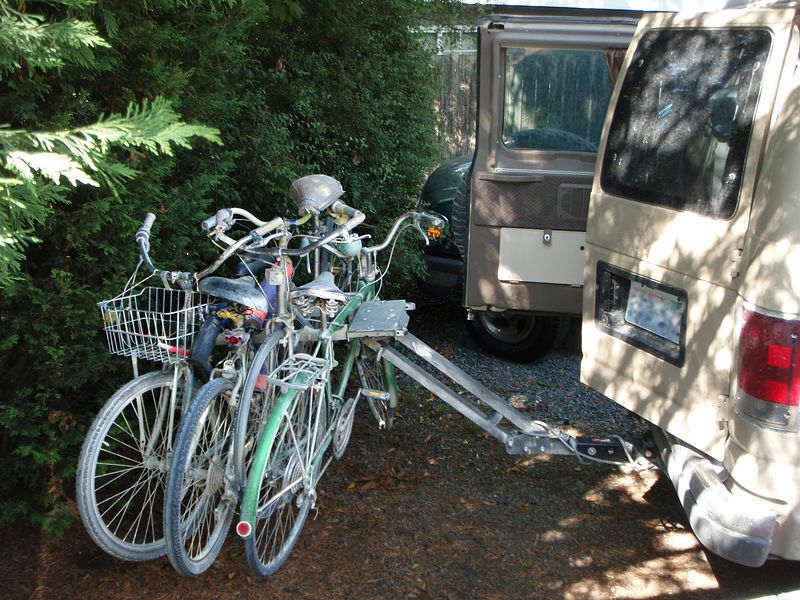 Gas mileage: While the Sportsmobile might get good gas mileage for an RV, it's still pretty painful. With the gasoline V-10 engine, the best mileage we get is 13 MPG, when driving primarily on country roads at about 50 MPH. City driving, offroad driving, and high-speed driving (>70 MPH) all result in something closer to 10-11 MPG. 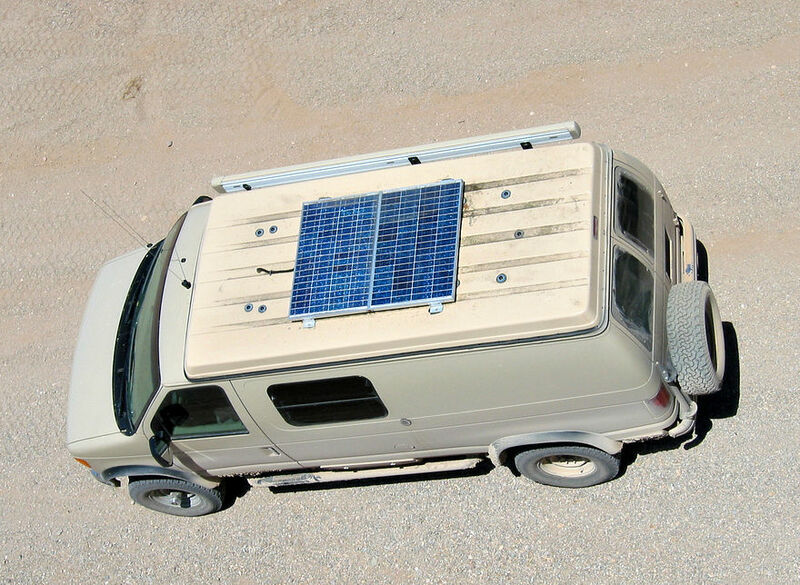 Radio Switch: Sportsmobile provides a switch that lets us use the radio when the engine is off — powered by the van's "house" battery, which is charged by the solar panels. Unfortunately, the circuit is set up such that this switching relay itself is powered by the van's starter battery instead of the house battery. 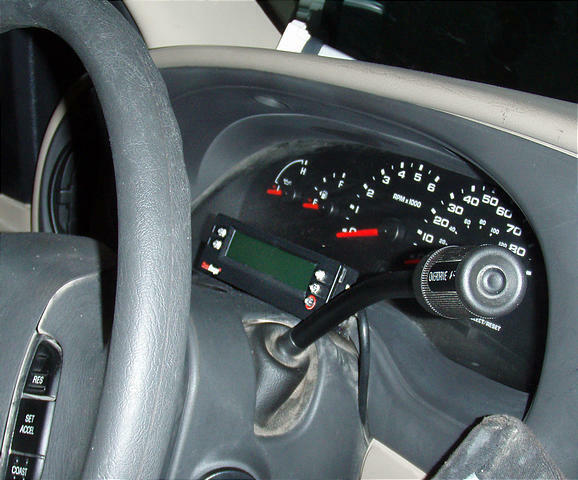 If the radio is left on for a week or more, the van's starter battery will eventually be completely drained from the small amount of current used by the relay. Passenger Seat: The Ford van design engineers chose to position the engine (which sits between the two front seats in the E-Series vans) a few inches to the right of center, giving the driver a bit more leg room at the expense of the passenger. The passenger's left leg room is therefore somewhat cramped, and the foot area can get a bit hot from the heat leaking out of the engine compartment. Someday we'll add some additional insulation to try to improve the excess-heat problem. 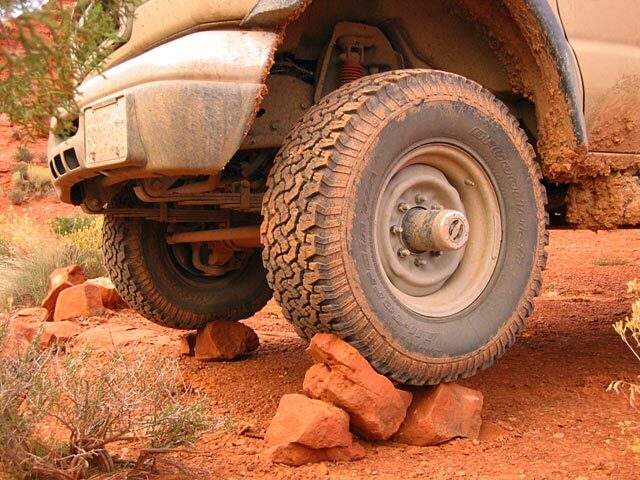 Front axle travel: As there's only a couple inches of travel above the front axle, it can smack the bump stops if both front wheels hit a surprise obstacle simultaneously. But, in practice, this isn't usually an issue. Engine Speed Limiter: The Ford engine comes with a speed limiter that cuts engine power a little above 90 MPH. 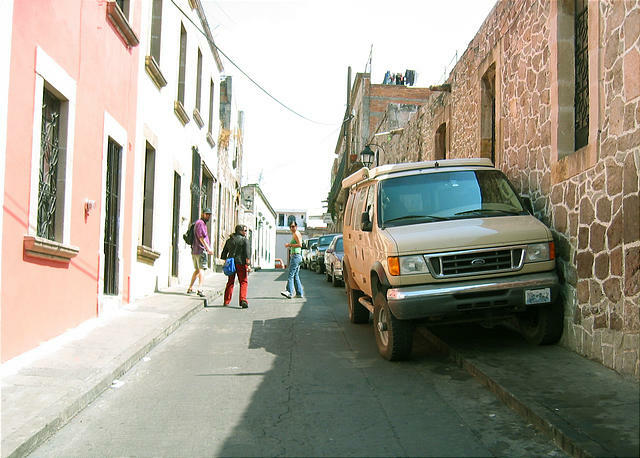 That might sound pretty fast for van, but it's been a problem for us quite a few times when trying to pass long vehicles on two-lane roads, especially in rural Mexico. There's nothing like having the engine cut out on you when you're out in the opposite lane and there's another vehicle coming toward you at a combined speed of 150 MPH. To work around this, we have tried out a couple of "performance tuner" devices, neither of which have worked out. 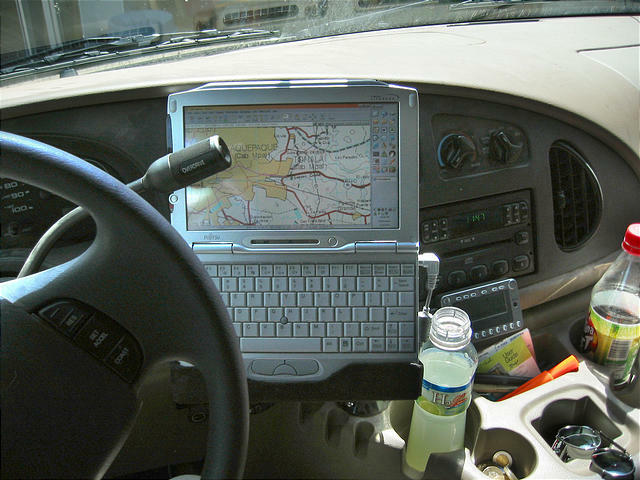 We tried the Superchips Tuner (1714: 1999-2004 gas engines), but while it supports the V-10 engine on the F-series trucks, it doesn't support the very same engine when on E-series vans. 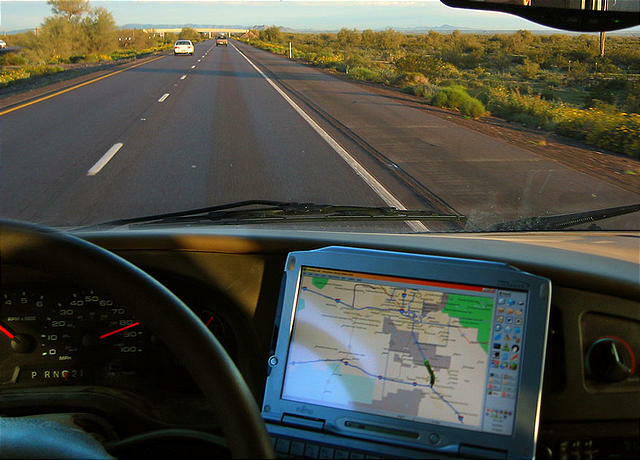 We also tried the DiabloSport Predator Tuner (U7152: 1999-2004 Ford F350 6.8L), and while it allowed us to disable the engine computer's speed limiter, it caused our speedometer to read 10% too low. The DiabloSport Predator Tuners are supposed to support custom speedometer adjustment, but for some reason that feature isn't enabled on our Predator U7152 unit. It might just be a defect, but the DiabloSport people weren't much help when we called. 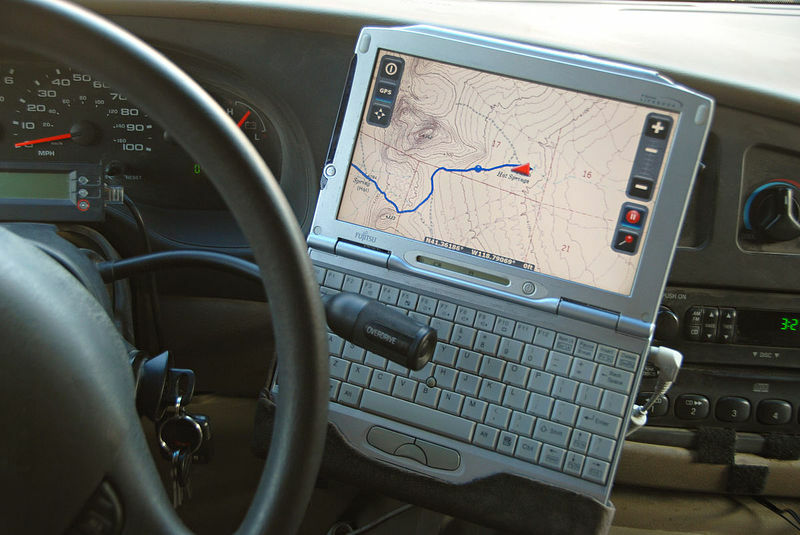 Sportsmobile Message Forum — an excellent information & discussion resource! Sportsmobile Yahoo Group — There's some good historical information here, but the Message Forum has the most recent activity. The Badgers have made many interesting customizations to their Sportsmobile!